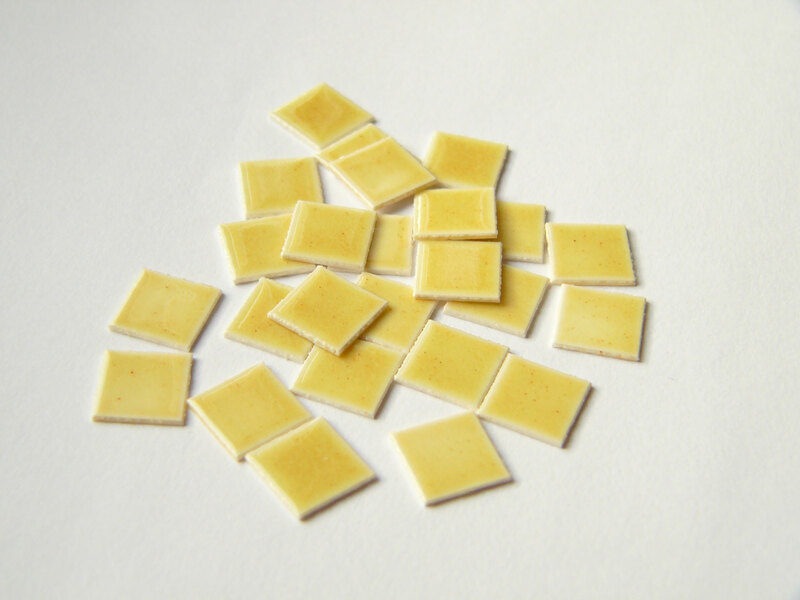 We make real ceramic miniature tiles, floors, walls for miniature enthusiasts in 1 inch scale (1:12). 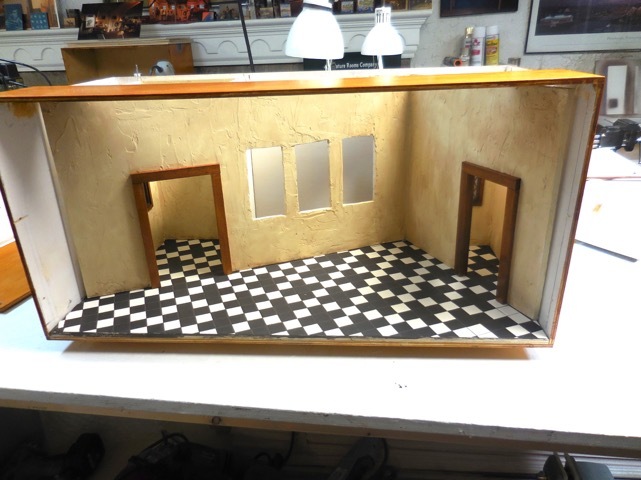 Robert Off made this roombox showing the studio of the Dutsch painter Vermeer. We contributed the floor tiles, which we made according to his wishes. This box is my vision of what his Delft studio may have looked like in 1650. 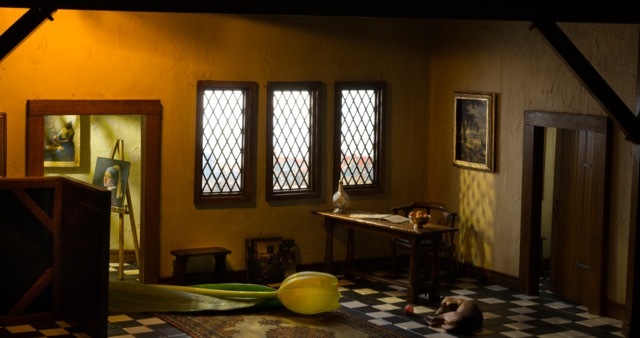 Not much is known about Vermeer and only 34 works attributed to him are known to exist today. It is also theorized by a number of scholars that he used a mechanical optical device known as a camera obscure, a device similar to a pin hole camera with a projector lens, to assist him in creating the correct perspective of the scene. 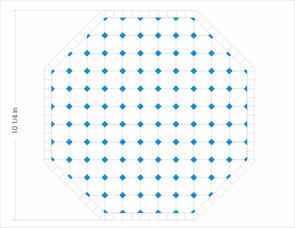 On the left you can see the complex floor layout. 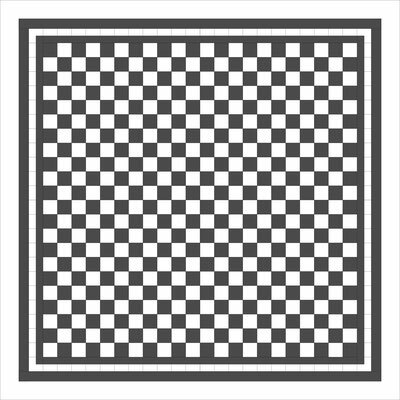 It is turned 25° to the right angle. Subsequently every border tiles was different from the other. Hence we had a lot of work making the border tiles, keeping them in the right order and remember the right colour of each tile thoughout the production processs. After the firing we glued the border tiles on the layoutpaper in order to have them save of the destinated place. 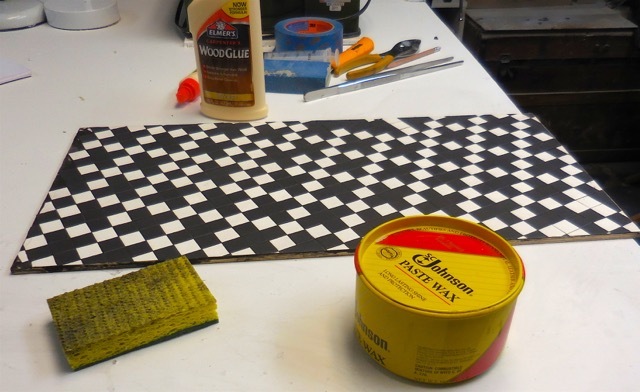 Robert got all other tiles, glued them on the paper and did the finishing work. We thank Robert so much for having had the chance to contribute our work to your historic roombox! We are thankful of having Therasa describing her work! 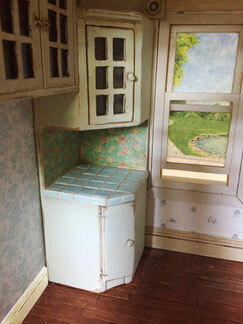 I revamp miniature furniture by stripping down, sanding, painting, staining, and adding personal flair to each piece. 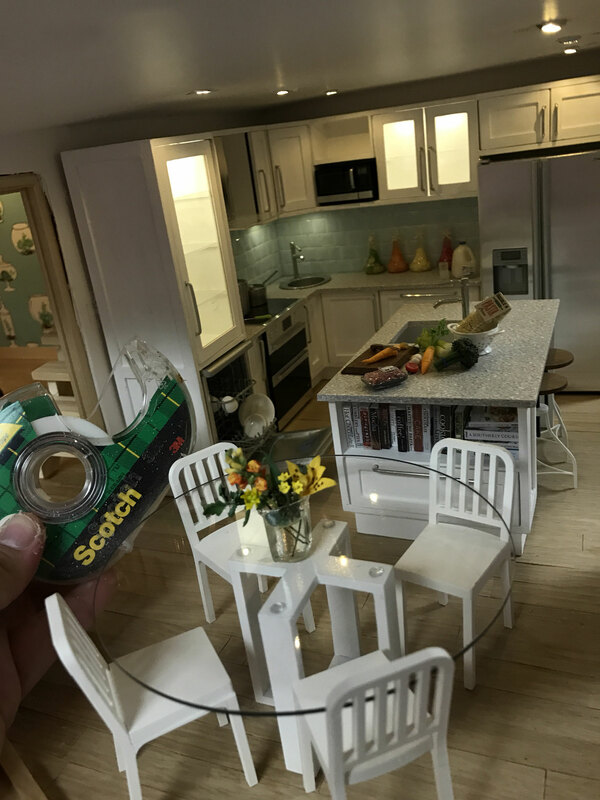 the added flair to this Kitchen cupboard piece is the beautiful porcelain tile color # 16150 (blue with a touch of green) that I have individually placed as the countertop. 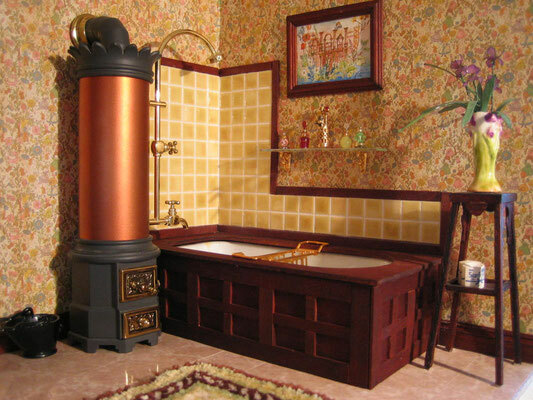 We are grateful to get description of how Theresa applied our miniature tiles. Thank you so much! We love the styl and are impressed how real the bathroom looks! 1. 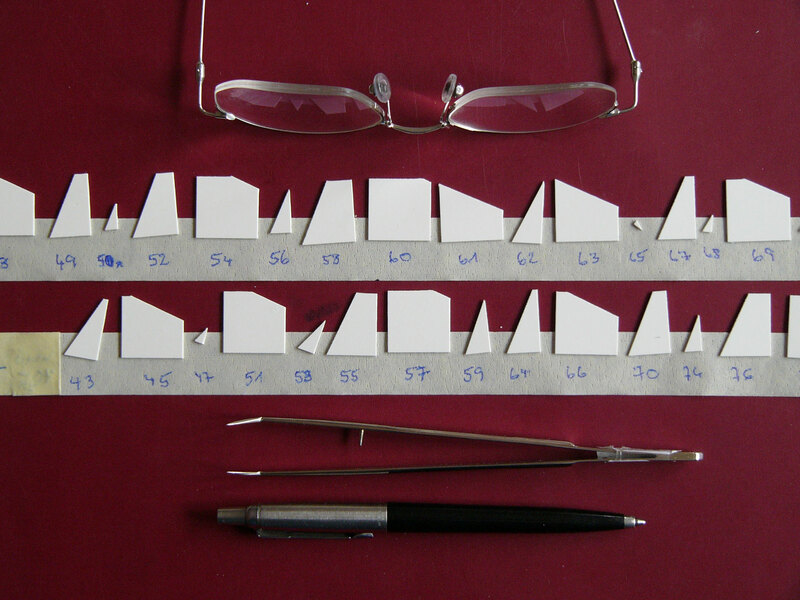 You like us to make the layout and cut all tiles to size. 2. You make the layout, buy regular tiles and cut the tiles by yourself. Then we count the tiles and made a detailed quotation including shipping. 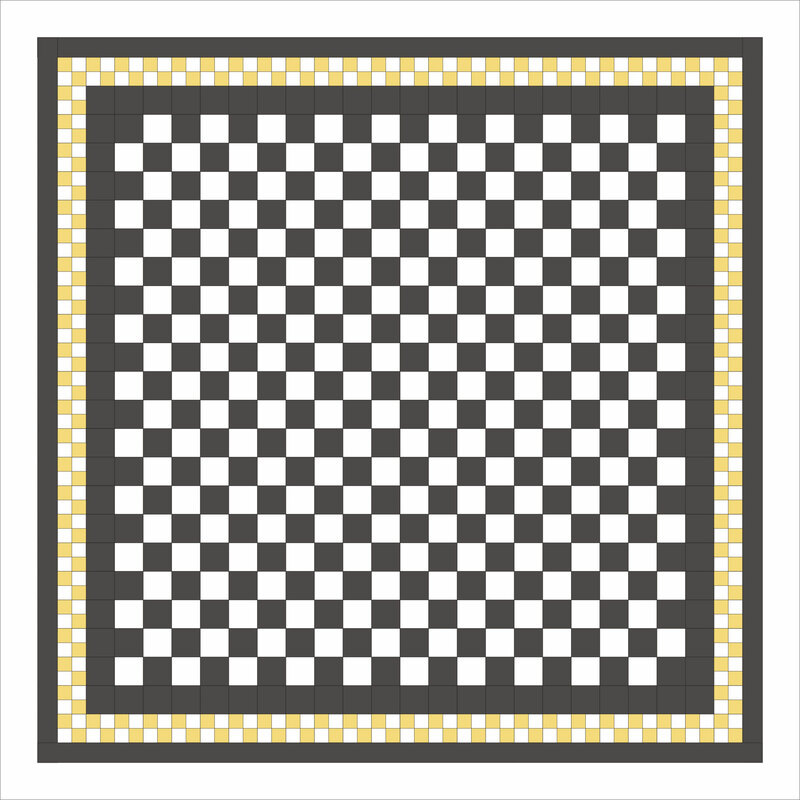 Here are 3 price versions for all miniature tiles covering this floor. 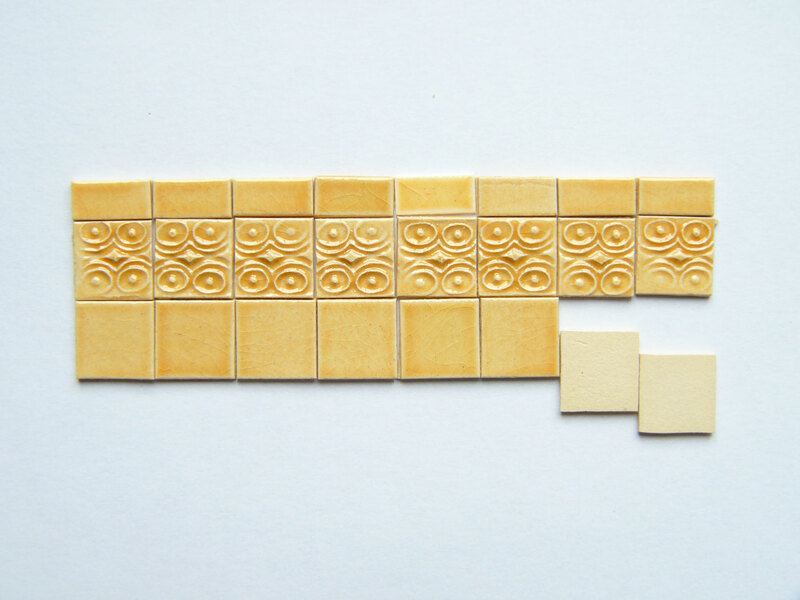 c) inlay tiles and rim tile with golden surface: 415 US Dollar. 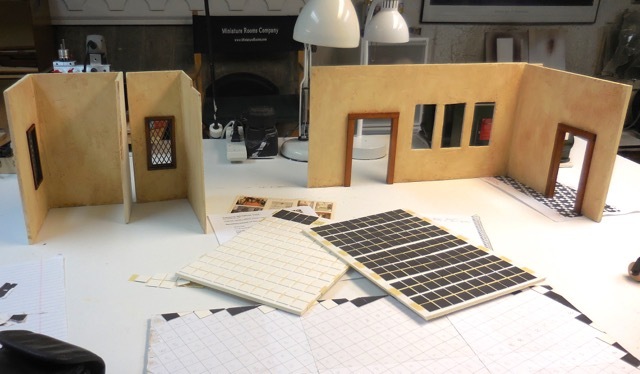 For that price you get the layout printed on paper in the size of your room, all tiles cut to size and a recommendation on how to lay the tiles. 2. 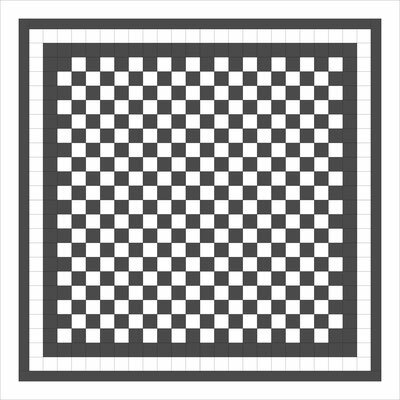 If you like to make the layout for your floor by yourself, we will be happy to supply regular tiles which you cut to size. 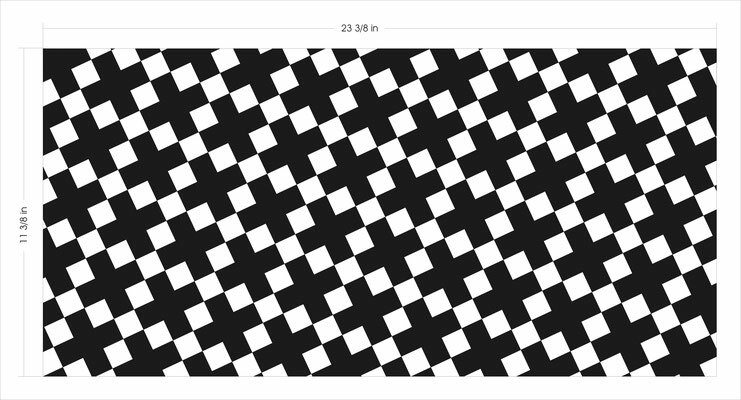 Regular tiles for the floor would be approx. 285 US Dollar. Whatever you prefere we would be pleased to serve you! All tiles cut to size for a floor of this size will be 187 US Dollar + 30 US Dollar for the layout and +9 US Dollar for shipping. 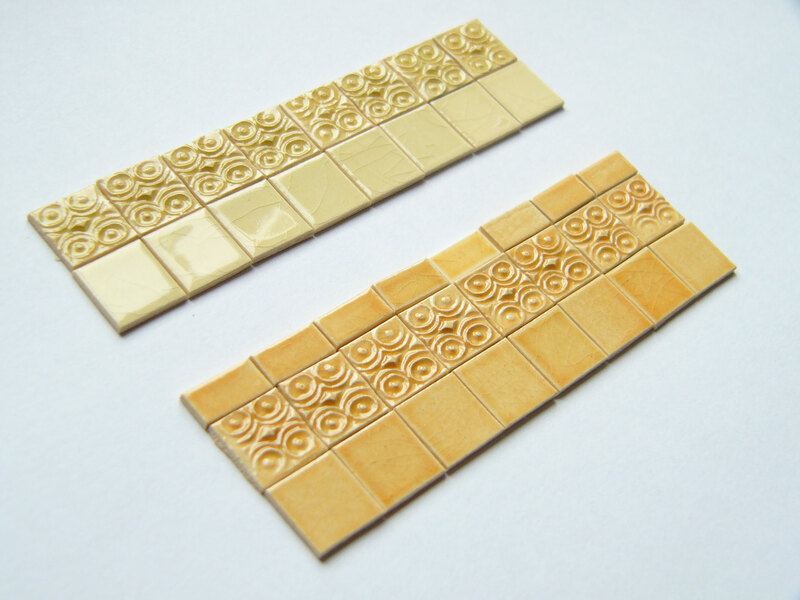 For this price you get all tiles in the colour of your choice (except for gold, bronce and silver which require a further production step), the layout printed on paper and a recommendation on how to lay the tiles. 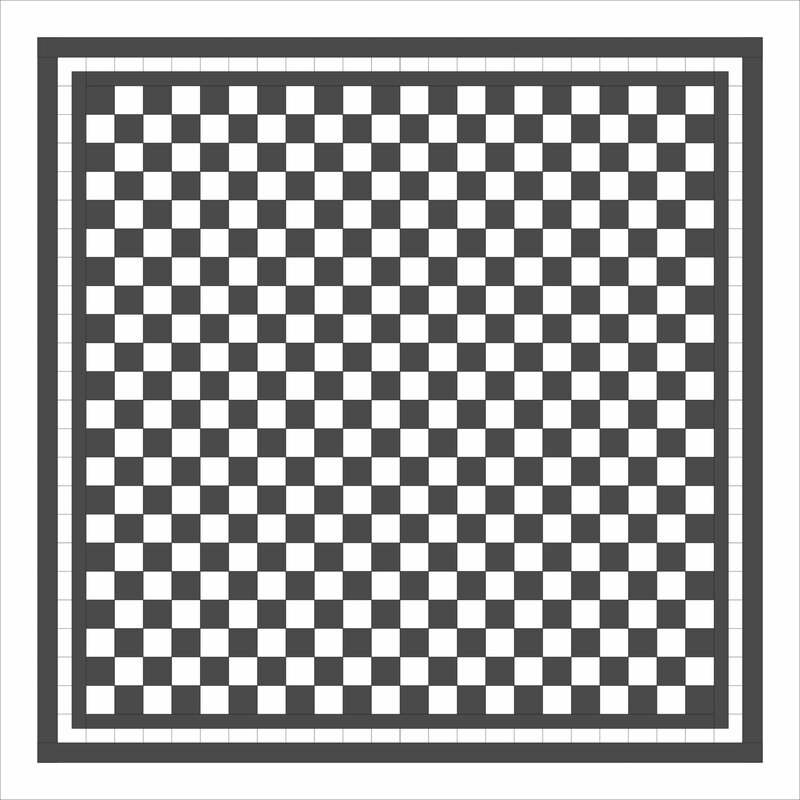 Top left: the floor will mainly consist of basic black and white tiles Special tiles are at the outer border only All miniature tiles for this floor will be 240 US Dollar. 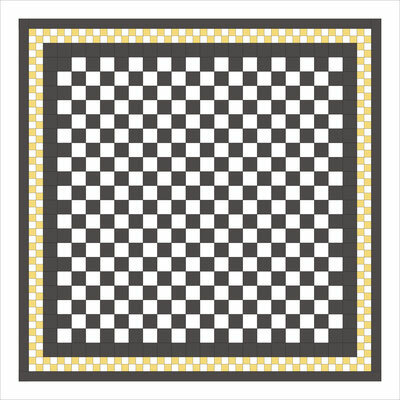 Top right: the row of white tiles of the top left floor is replaced by quarter tiles with a white and with a golden surface. 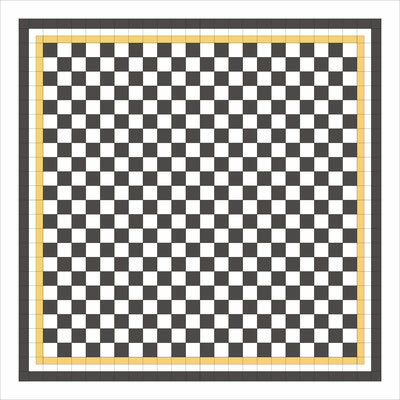 As more tiles are needed and the producition of the golden tiles need a furhter step the tiles for this floor will be 375 US Dollar. 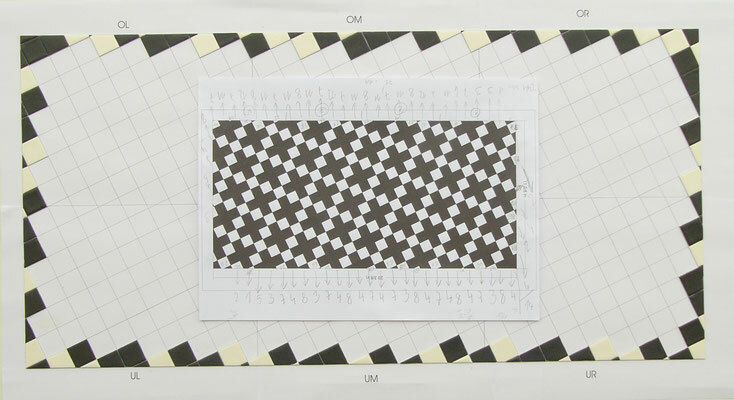 Bottom left: layout is very siminar to the top left floor. 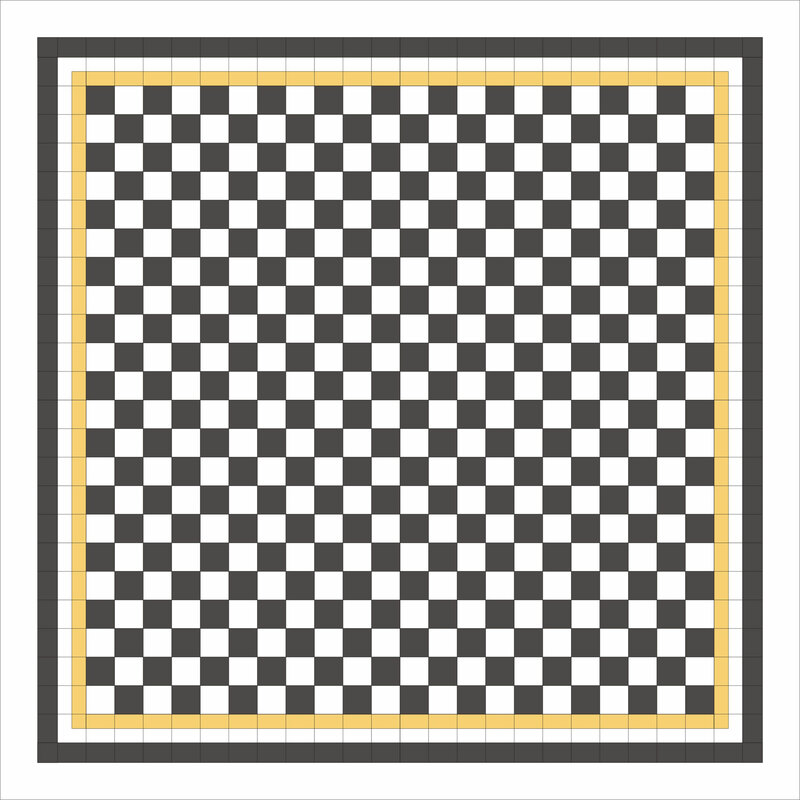 In this case the border consists of 2 rows of half tiles. 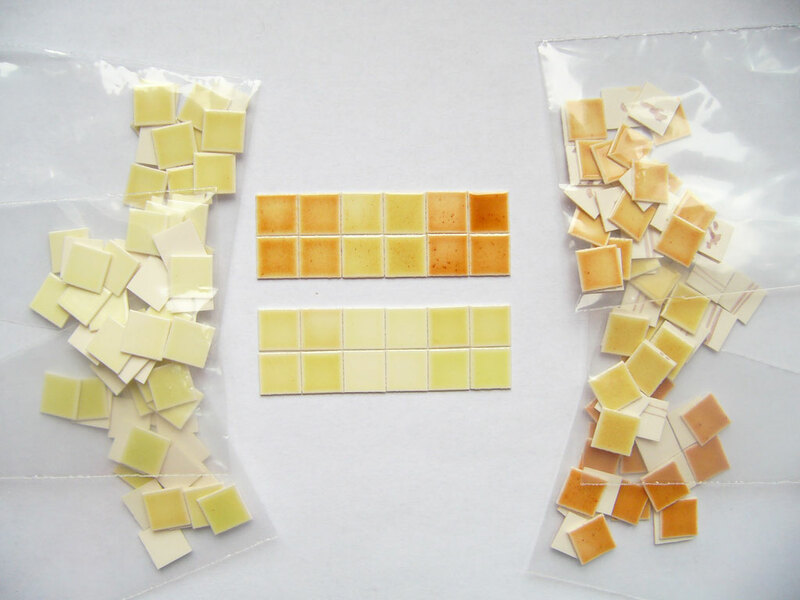 Tiles for thist project will be 267 US Dollar. Bottom right: if you replace the inner back border of the left floor by tiles with a golden surface the price will be 297 US Dollar. 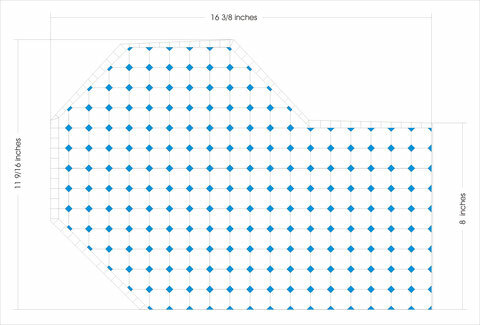 Shipping costs for the tiles cut to size and the floor plan are 9 US Dollar. Different floor sizes will need a different amount of tiles. Prices will vary accordingly. We have been offering a very broad range of tiles. One colour tiles have been part of the programm as well as hand painted tiles, relief tiles and wall murals. In the future we will concentrate our programm on a large variety of one colour single tiles (examples see March) and custom made floors and walls. Hence we browsed through our stock and sorted out designs which our customers rarely ask for. It was not easy to sort them out as put so much engery and love into making them. 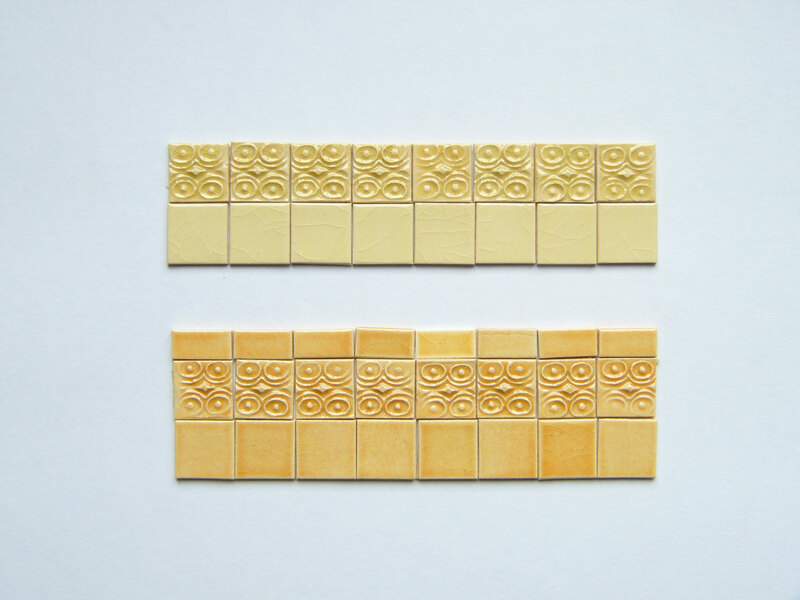 The relief tiles shown above belong to the ones we will not make any more. You will find the tiles as remnannts in our etsy shop. Pllease order them there! 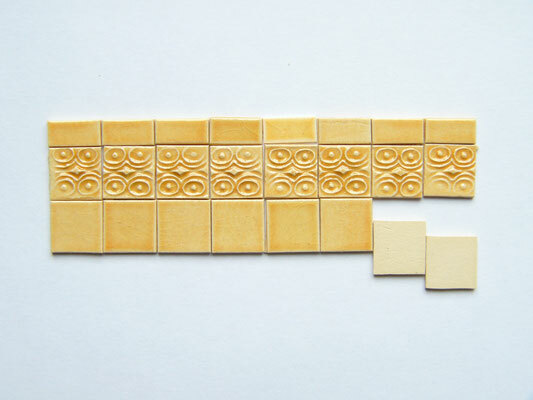 All of these tiles are covered with a traditional very lively glaze. In the long run they get a few cracks on the surface which make them look very like the ancient full size tiles. 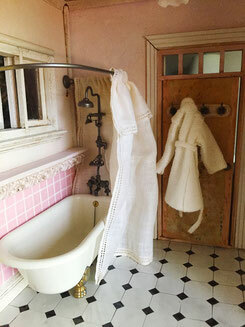 By the way: the yellow tiles a the very right are the ones applied at the bathroom shown at the January issue below. 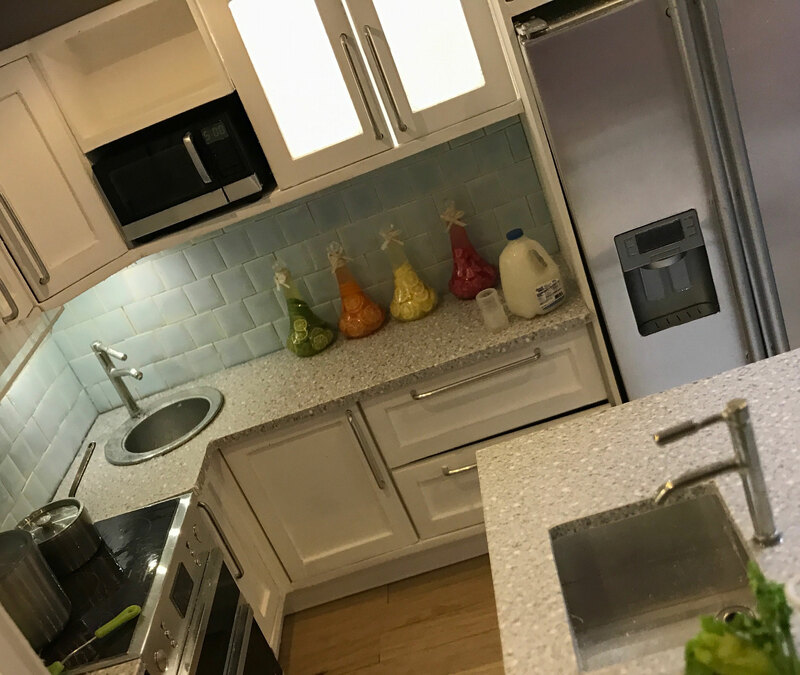 Katy made contemporary kitchen with a cool and crisp look. Following this styl she had chosen one color tiles for the backspash in a bluegreen (no 26200). Instead of placing the tiles on top of each other Katy placed them like railway tiles. By doing so emphasized the horizontal lines of the backsplash giving the arrangement a certain tension. We like Katy´s well balanced modern kitchen very much! In old times a lot of bathrooms are tiled only around the buthtub and the shower area. 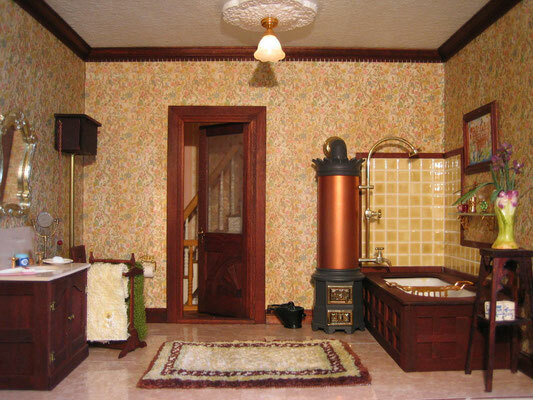 The owner of this miniature bathroom (thank you for your permission to show the pictures!) has chosen a traditonal highly glossy glaze in a warm yellow. The slight variation in tile color gives the tiled area a lively look and supports the cosy athmosphere of this bath.